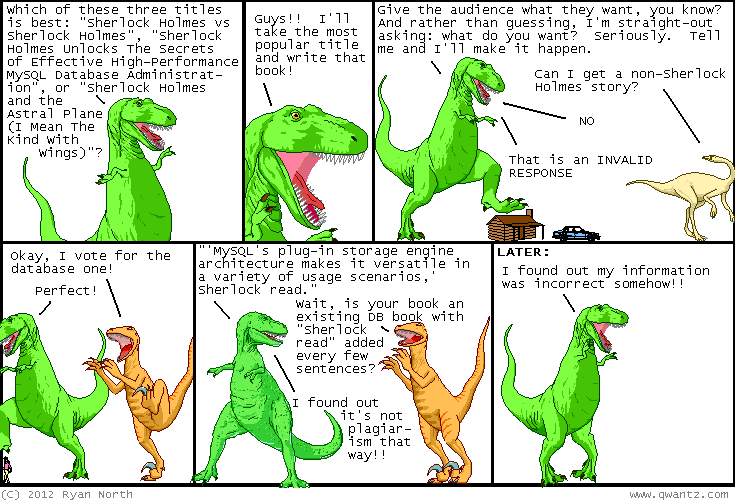 Dinosaur Comics - January 19th, 2012 - awesome fun times! –We all might be dead SOMEDAY! January 19th, 2012: Yesterday Dinosaur Comics participated in the SOPA/PIPA blackout, as you probably noticed! You can go back to yesterday's comic and read it without interruption, and with the non-censored title text it was originally going to have! It was a success, but there's still work to do. If you'd like to see the censored page again, add butiwouldratherbereading=theRIAAversionoftheinternet to the comics URL. One year ago today: my notes for this comic read "dromiceiomimus spends the night and utahraptor asks for a star wars analogy"